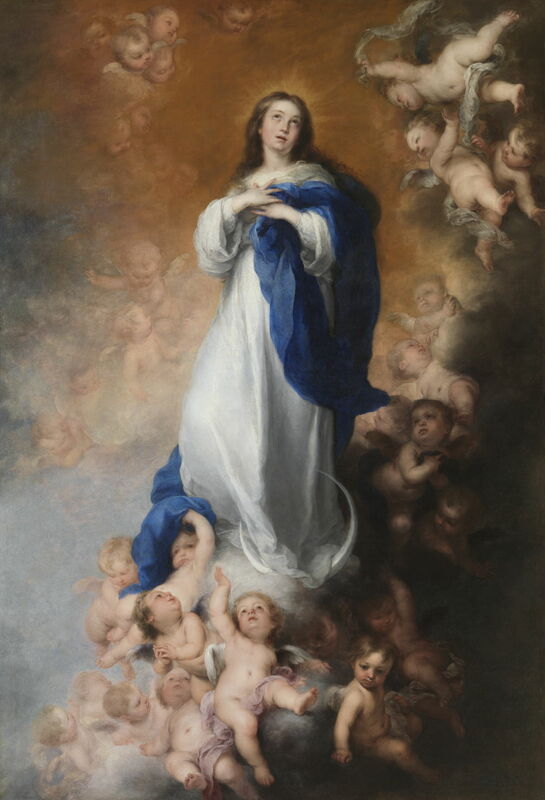 Bartolomé Esteban Murillo (1617–1682), Immaculate Conception (of Soult) (c 1678), oil on canvas, 274 x 190 cm, Museo Nacional del Prado, Madrid, Spain. Wikimedia Commons. By the 1660s, Bartolomé Esteban Murillo (1617–1682) had found a mature style for his religious paintings, and was making some innovative secular works which gave glimpses into the lives of the poor in Seville. Bartolomé Esteban Murillo (1617–1682), Saint Thomas of Villanueva Dividing his Clothes among Beggar Boys (c 1667), oil on canvas, 219.7 × 149.2 cm, Cincinnati Art Museum, Cincinnati, OH. Wikimedia Commons. Saint Thomas of Villanueva (Villanova) Dividing his Clothes among Beggar Boys (c 1667) provides an unusual combination of both the religious, as the life of a saint, and secular, in showing the poor children of the Spanish cities at the time. It shows a story from the childhood of Saint Thomas of Villanueva de los Infantes (1488-1555), which claims that when he was a child, he often came home naked, having given all his clothing to poorer children. Thomas became a friar of the order of Saint Augustine, and was famed for his care of the poor when he later became the Archbishop of Valencia. Thomas is the boy in the clean white shirt to the right of centre, who has just given his jacket to the boy to the left, who is dressed in dirty rags. It looks like Thomas is preparing to part with his trousers too. 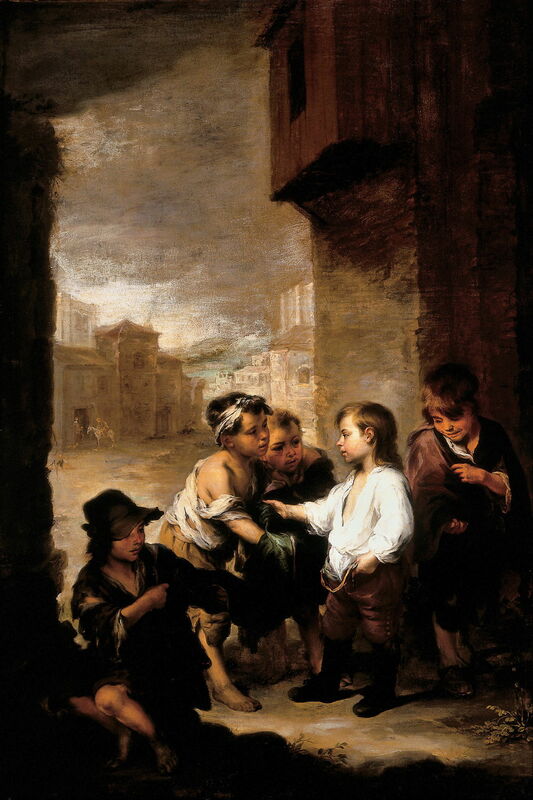 These children could just as easily have appeared in one of Murillo’s secular paintings of street life in Seville, but here tell a moralising story from the life of the saint. Bartolomé Esteban Murillo (1617–1682), The Return of the Prodigal Son (1667-70), oil on canvas, 236 x 262 cm, National Gallery of Art, Washington, DC. Wikimedia Commons. 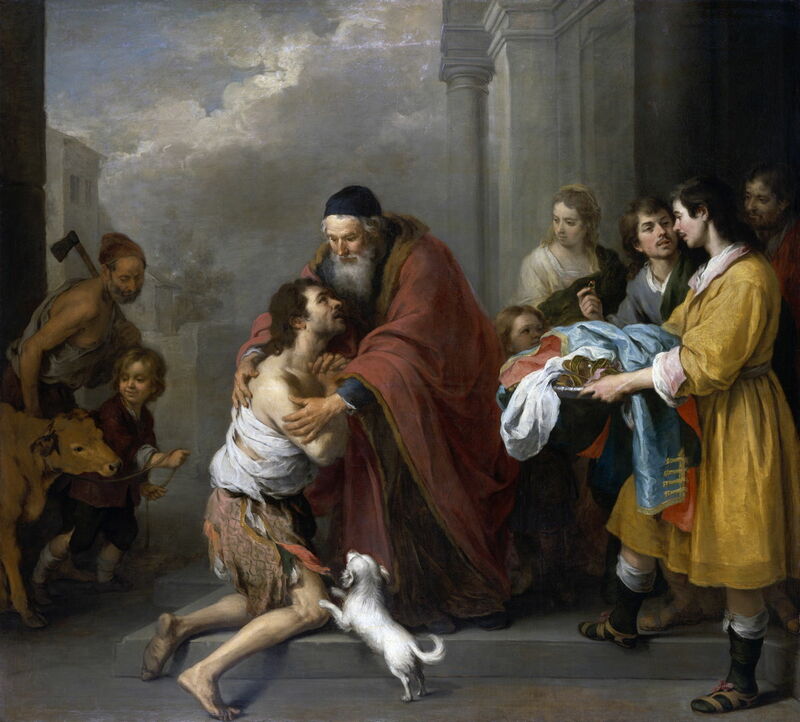 Murillo’s painting of the well-known parable of the prodigal son, recorded in the gospel of Luke chapter 15, verses 11-32, is another painting showing the effects of poverty. Unlike his older brother, the prodigal son blew his inheritance until he was destitute, then returned to his father begging to be employed as a servant. Murillo, as with almost every artist who has painted this story, shows the moment of The Return of the Prodigal Son (1667-70), when his father gives the prodigal redemption, and welcomes him back with great rejoicing. To the right of the reunion between father and son, a servant stands holding a tray full of clothes to replace the tattered rags which the son is wearing. His feet are thoroughly filthy too. Bartolomé Esteban Murillo (1617–1682), Self-portrait (1668-70), oil on canvas, 122 x 107 cm, The National Gallery (Bought, 1953), London. Courtesy of and © The National Gallery, London. 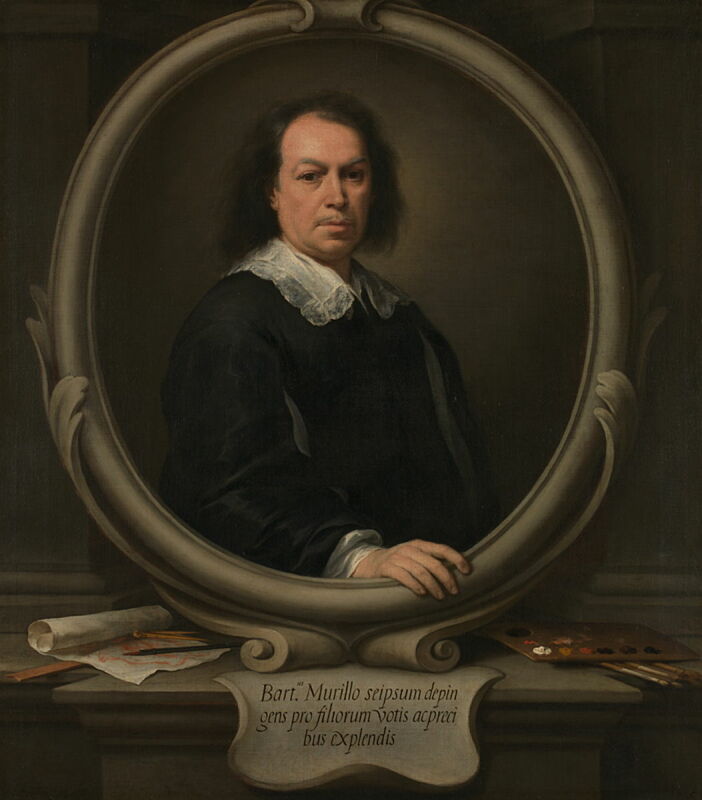 His Self-portrait from 1668-70 was, according to its Latin inscription, painted at the behest of his children, and uses a trompe l’oeil formula which was popular at the time. This was probably based in turn on the frontispiece engraving which had become popular in printed books. Murillo appears in an oval frame, his hand reaching out from the frame in a visual pun. Around that frame are the tools of his trade; on the left, a pencil and paper, and on the right, brushes and a palette charged with oil paint. The inscription reads Bart[olo] Murillo seipsum depingens pro filiorum votis ac precibus explendis, meaning Bartolomé Murillo portraying himself in fulfilment of the wishes and prayers of his sons [children]. This painting apparently made its way to England via Brussels, and was the inspiration for Hogarth’s famous self-portrait The Painter and his Pug of 1745. 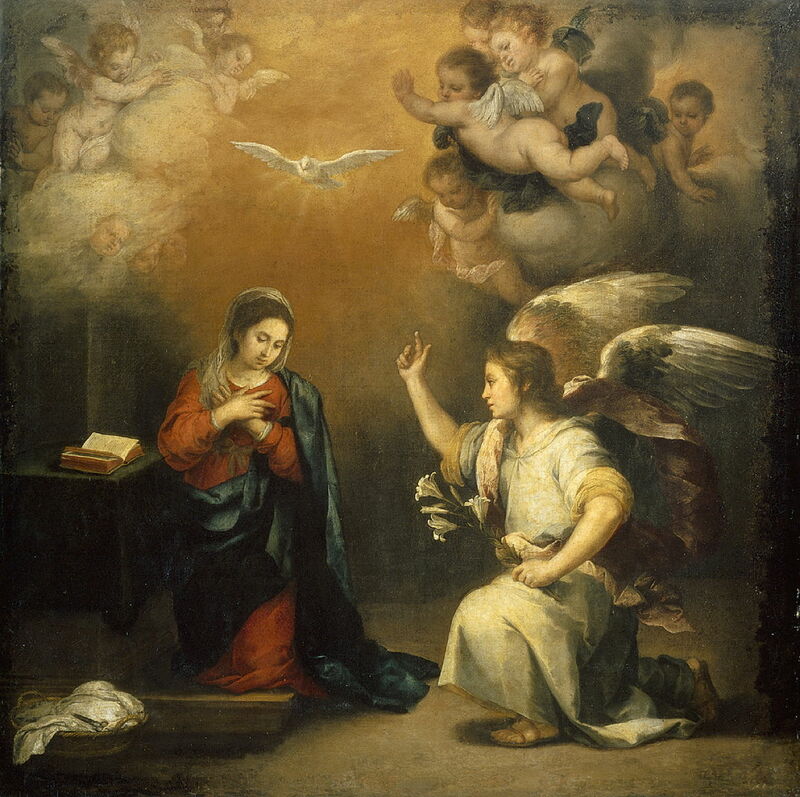 Bartolomé Esteban Murillo (1617–1682), The Annunciation (c 1650), oil, 183 x 225 cm, Museo Nacional del Prado, Madrid, Spain. Wikimedia Commons. In the last article, I compared two of Murillo’s paintings of Joseph and Potiphar’s Wife; he must have painted many more versions of the Annunciation, and this is an ideal opportunity to compare one from fairly early in his career, about 1650, above, and another from probably around twenty years later, below. His composition has remained almost unaltered, although the sides have been reversed, perhaps to fit better with the intended settings. The later painting has far more exuberant winged putti, though: they are not just more numerous, but more of their bodies and wings are shown, now filling much of the upper third of the canvas. Murillo has also added a basket of linen under the table which bears Mary’s book. Bartolomé Esteban Murillo (1617–1682), The Annunciation (1660-80), oil on canvas, 98 x 100 cm, Rijksmuseum Amsterdam, Amsterdam, The Netherlands. Wikimedia Commons. 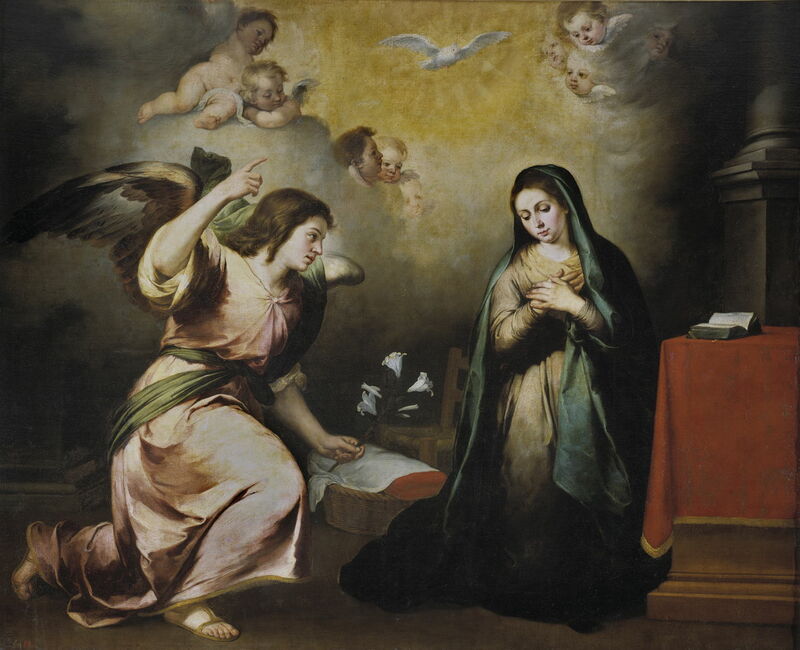 Murillo’s most romantic flights are seen in the related doctrinal expression of his Immaculate Conception, in this instance of Soult from about 1678. He is thought to have painted about two dozen versions of this theme, with its slightly different iconography from that of the Annunciation. The Virgin Mary, who normally looks up to God in heaven, is shown alone, usually wearing white robes with her signature blue cloak. She stands in the heavens, her arms crossed over her chest with the moon at her feet, surrounded by clouds, a golden light, and putti who are often winged. In some examples, there are twelve stars around Mary’s head, although not in this instance. This painting was commissioned by a canon of the cathedral of Seville for the city’s Hospital de los Venerables, then a residence for priests, and ironically now the Velázquez Centre. 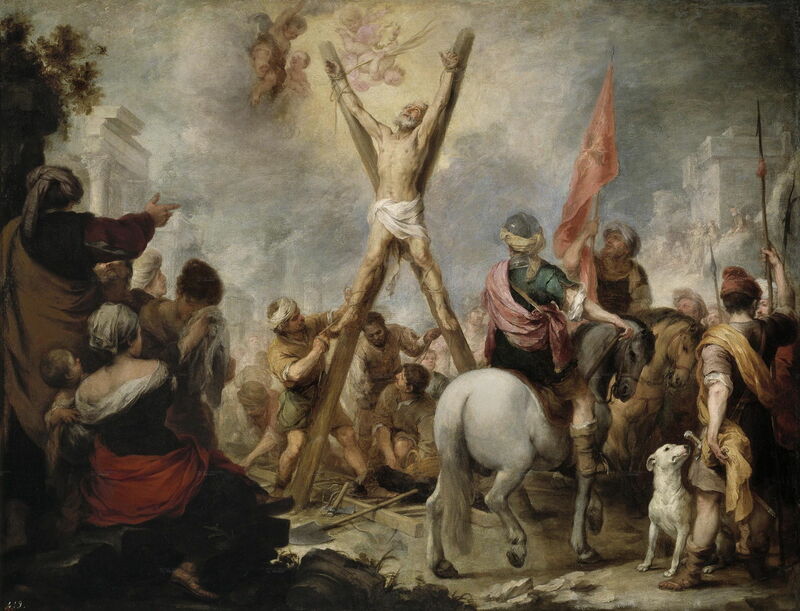 Bartolomé Esteban Murillo (1617–1682), The Martyrdom of St Andrew (1675-82), oil on canvas, 123 x 162 cm, Museo Nacional del Prado, Madrid, Spain. Wikimedia Commons. The Martyrdom of St Andrew, painted by Murillo in his later years between 1675-82, shows a well-known episode from the lives of the saints. Andrew was one of the Apostles of Jesus Christ, who is said to have been martyred by being crucified in the city of Patras, to the west of Athens in Greece. Although the earliest accounts report that he was bound not nailed to an upright cross, the legend grew that the cross had been positioned in the form of an X, a crux decussata or saltire, the origin of the flag of Scotland, whose patron saint is Saint Andrew. This is one of Murillo’s rare crowd scenes, whose figures tell the legend in detail. The artist maintains parallels with the crucifixion of Jesus, with a small group of weeping women in the left foreground, and the presence of spear-bearing soldiers at the right. Bartolomé Esteban Murillo (1617–1682), The Heavenly and Earthly Trinities (‘The Pedroso Murillo’) (1675-82), oil on canvas, 293 x 207 cm, The National Gallery (Bought, 1837), London. Courtesy of and © The National Gallery, London. 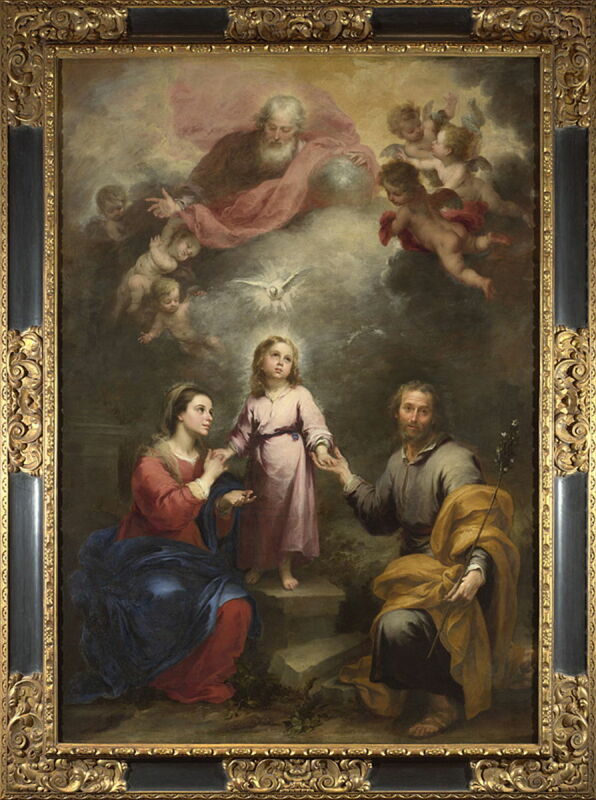 Probably the latest work of my small selection is Murillo’s unusual The Heavenly and Earthly Trinities, sometimes known as The Pedroso Murillo, also from the period 1675-82, and most probably within a year or so of his death in 1682. This is based on the episode reported in the Gospels, in which the young Jesus returned from the Temple in Jerusalem with his parents, Mary and Joseph (who is shown as younger in appearance than in most Nativities). Together they form an earthly trinity, which is matched with the heavenly trinity formed by God the Father, Jesus, and the Holy Spirit in the form of a white dove. This expresses clearly the doctrine of the dual nature of Jesus as both human and part of the heavenly trinity. Murillo is thought to have painted this when he was working on commissions for the Capuchin church in Cádiz. It was commissioned by a Marqués del Pedroso, in Cádiz, hence its alternative title, and is the best-known example of this theme in Christian art. Bartolomé Esteban Murillo died in Seville on 3 April 1682, at the age of 64. He is said to have been seriously injured when he fell from scaffolding in Cádiz, from which he was painting an altarpiece for the Capuchin church there, and to have died from those injuries some months later. Until the nineteenth century, he was generally held to be the finest of the Spanish masters, and his influence continued through his pupils, and in the work of Thomas Gainsborough and Jean-Baptiste Greuze. Posted in General, Life, Painting and tagged Gainsborough, Greuze, Hogarth, Murillo, painting, Spain. Bookmark the permalink.